I couldn’t help it; I started crying. I guess the girl and her mom walked away. I have no idea. My husband walked me out of the store to the car. I sat in the car crying for a long time but eventually went back inside to finish my shopping. I ended up buying that tank top because, it turns out, I look fierce in it! Be kind. Think about others before you speak. And if someone hurts you, you have to move on. The post went viral and Ms. Taylor is being praised for standing up against fat-shaming and body-shaming. But was that what really happened? Ms. Taylor is a photographer, not a psychic. There was nothing to indicate that the conversation was directed towards or even about her. The teen’s pointing out that she and a friend could fit into the top could have been a disparaging comment about her own size. After all, we fat people don’t hold a monopoly on hating our bodies. The mother’s response could have been a way to help her child feel better about it… you’re not too skinny, the top is too big. It’s true that some people are cruel enough to make fun of others but I don’t believe that’s what the teen and her mother were doing. Should Ms. Taylor not have been upset enough to sit in her car and cry “for a long time”? I’m also not a psychic so I don’t know what happened before she overheard the conversation that set off the crying jag. She could have had a frustrating shopping trip; you know the one when you can’t find anything you like or fits properly (except, of course, when you’re broke). Maybe her husband was getting impatient to leave or she was really hungry (I sometimes get weepy when my sugar’s low). Or maybe she is one of those overly sensitive people who are convinced that every comment, whisper or glance is about their weight. I do know that, while she advised people to “be kind” and “think about others”, Ms. Taylor lashed out unkindly in her original post, saying that the teen was not “half the woman” she is. 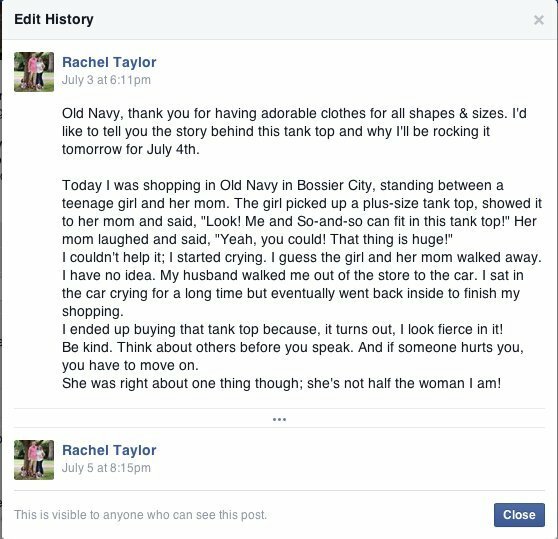 She was called out on it… rightly so… and got to take her words back in time to be rewarded by Old Navy with a gift card. It’s the least they could do for all the free publicity. 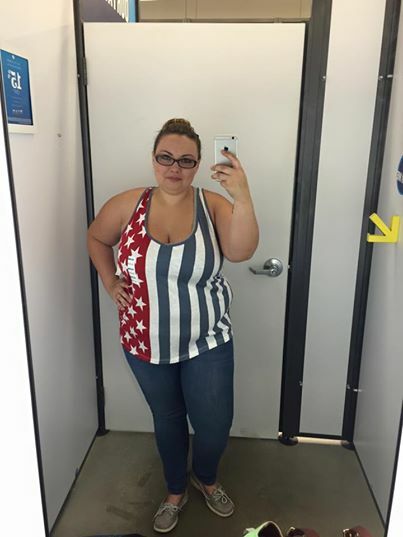 Now if only Old Navy carried their Women’s Plus size line (which goes up to 4X or 28/30) in stores or that the tank top came in my size… it is cute. Previous Post My Big Man is Stylin’!